This recipe comes from [%bookLink code=0966772202 "What Can I Bring? Sharing Good Tastes and Times in Northern Virginia"], a spiral-bound cookbook by the Junior League of Northern Virginia. Read more about Nancy Greenleese's efforts to cook American food in Italy in "Dinner, American-style." Combine first 6 ingredients in a zip-top plastic bag. Place 1 chicken breast in the bag; seal and shake to coat. Place chicken breast on a greased or nonstick baking sheet or pan. 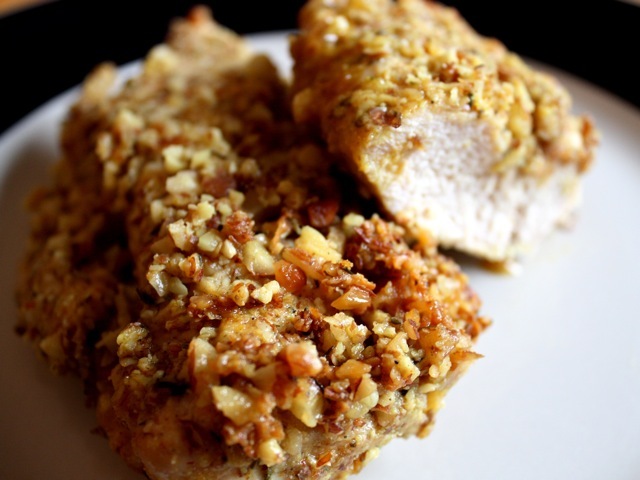 Press almonds on top of chicken. Repeat procedure with remaining chicken breasts. Bake at 350 degrees for 20 minutes. Serve hot. Culinate editor's notes: Pulverizing the almonds in a nut chopper or food processor until chunky makes for a more even coating of nuts, herbs, spices, and cheese. Four large chicken breasts will just fit inside a 9-by-13-inch baking dish. Note that large chicken breasts will take longer than 20 minutes to cook — a total cooking time of 30 to 40 minutes is more likely. Turn the breasts once halfway through cooking. Finally, serve with whatever combo you like on the side: fresh rice or couscous and sautéed greens, or roasted veggies and salad. Or follow Nancy Greenleese's lead and go all Midwestern, with sides of potatoes and corn on the cob.